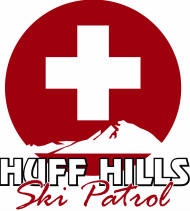 Outdoor Emergency Care (OEC) is the training course for the Huff Hills ski resort's Ski Patrol. OEC course work includes didactic, practical and hands-on instruction per the curriculum maintained by the National Ski Patrol. This website contains supplemental material and information to the "Outdoor Emergency Care, Fifth Edition" text book, that are used in conjunction with the class. Word documents (.doc) are sample chapter test questions. PowerPoint files (.ppt) are the chapter slide decks that are reviewed in class (a couple are .pdf). All course content is on this page. Scroll down for all blocks/chapters.